June gloom came early this year, with a transition in mid-May to the typical June low clouds, sprinkles, and occasional sunbreaks. Actually, this kind of weather in late May is not that unusual. Here is a plot of Seattle-Tacoma temperatures for the past four weeks (with normal highs and lows shown as well). Above normal temps through May 15th, and then a switch was flipped, with most days not even reaching the normal highs. 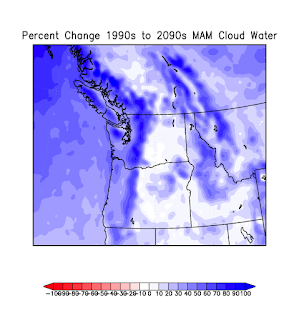 East of the Cascades, shielded from the low-level marine air by the Cascades, the transition was not as profound, as shown by temps at Pasco in the Tri-Cities. Conditions have been very close to normal during the past two weeks, which is good for agriculture and those worried about wildfires. Visible satellite imagery tells the story another way. Take a look at the visible image from 12:30 PM on Thursday. Classic late spring pattern, with a huge field of low clouds over the eastern Pacific. Look closely and you will see the low clouds pushing to the Cascade crest, with coastal California from San Francisco southward socked in. Why the low clouds? Blame high pressure! Yes, you have read that correctly. Here is the surface pressure and wind forecast for 2 PM on Thursday. A big area of high pressure over the eastern Pacific centered due west of the CA/OR border. Why does high pressure offshore produce gloomy conditions west of the Cascade crest? Many reasons! First, simple pressure differences. With high pressure offshore and lower pressure inland, low level cool air gets pushed into western Washington and Oregon. Next, high pressure is associated with sinking air aloft, something meteorologists call subsidence. Now the sinking has to decrease near the surface. Sinking air causes warming, so there is more warming aloft. With more warming aloft, a stable layer or an inversion (temperature increasing with height) can occur. In fact, if we look at the vertical sounding at Quillayuate (on the WA coast) on Thursday at 5 PM, that is exactly what happened at around 800 hPa--roughly 4000 ft (red line is temperature, blue dotted line is dew point). Below the inversion the air is nearly saturated (temp and dew points are nearly on top of each other). A stable layer aloft allows a layer near the ocean surface to moisten and get full of low clouds. But as in those late-night commercials, I have to say: WAIT, there's more! The high pressure results in northerly flow along the West Coast, moving cooler water from the north southward and resulting in upwelling of cooler water from below to the surface near coast (particularly from southern Oregon down to central CA)--see sea surface temperature plot from yesterday below. Cool water helps cool the air to saturation, enhancing clouds! So high pressure offshore gives us sustained, cool, cloudy weather. Generally not that much rain--often just some light drizzle and sprinkles. But hopefully enough to discourage Californians from moving up here (although our increasing traffic is our new secret weapon in that regard). Now some of you might think that May or June gloom is going to decrease under global warming. Think again. Some of our latest regional climate simulations suggest that global warming could make it worse! (see graphic below of change in March-May low clouds, between 1990s and 2090s) Blue is increasing low clouds. Why? Because the interior of the continent heats up faster than the ocean and warming temperatures causes lowering pressures. So the onshore pressure gradient increases under global warming, result in enhanced marine air influx west of the Cascade crest. Another good reason why you should support the carbon tax initiation, I732, and do what you can to reduce your carbon footprint. The highs lately in Seattle proper have certainly been average or near average. The good thing for tomatoes lately is the lows have not been BELOW average. For that I am thankful. Also, today, it certainly appears that Seattle proper is in the Olympic Mountains' rain shadow. I was hoping to catch a bigger break in my watering for a couple of days. But, heck, one can't always have everything. Regarding farming: I have heard it said that there were two good years of farming. 1955 and next year! A week of normal weather isn't going to save us. Tomorrow starts our next heat wave. I have to agree with Brian. In late March/early April of this year, when the winter's near-constant precip gave way to daily sunshine and warmth, I (and others) voiced concern over the very pronounced, sudden change, and questioned whether we had already started summer. The responses ranged from diplomatic assurances like those of Cliff (thank you, Cliff) that we were not yet facing a 2015 scenario, to responses of outright scorn from other readers for my essentially having dared to make such an alarmist suggestion written in prose they didn't like. Two months later, I believe it is fair to conclude that, overall, Seattle has experienced summerlike weather (well, sure ain't springlike) since late March. Precipitation has been minimal: April slightly more than a third of normal with May below half, but those numbers do not tell the real story of the persistent sunshine and low dewpoints causing more rapid evaporation of the soil and the premature melting of much of the winter's generous snowpack. Now, After having experienced 2 summer-like months, Seattle now faces "actual" summer. Given the current forecasts of sun, much-above normal temps (average high currently being 70-71 and every forecast day exceeding that) and negligeable precip as far as the eye can see, absent a complete about-face from the atmosphere, I don't see how we can avoid running into the same dry, tinderbox conditions of last year. Despite the abundant rainfall of this winter, the vegetation is already showing signs of stress, and, we still have in front of us the two months of the year with the strongest sunlight and highest evaporation potential. At the start of April, it was fair to say that we were doing extraordinary well with our considerable rain and snow surpluses. What about now? From a scientist's standpoint, how did our (overall) very warm and dry April and May affect the snowpack and vegetation, and, is a June and July similar to that of last year being expected? It's a given that they will both have above-normal temperatures; the question is how much above normal, and what is the current precip prognosis? Last year went nearly two months (June first to late July) with nary a drop. Although such extreme dryness is unlikely to repeat itself, how dry do we expect it to be? Thank you! Cliff, is there a "mirror image" of June Gloom on the Fall side, say in late September when the high begins moving south again? It seems like there should be one. "Another good reason why you should support the carbon tax initiation, I732, and do what you can to reduce your carbon footprint." CO2 or any gas at any concentration in the atmosphere cannot detectably alter the climate. The concept of greenhouse gases (GHGs) requires that the upper tropical troposphere warms Earth's surface, causing global warming. However, as the upper tropical troposphere is -17 deg C and the surface is at 15 deg C, 32 degrees WARMER, it is impossible for any IR radiation from the troposphere to warm the surface, as all energy levels equal to up to -17 deg C are already full in the surface and the IR is rejected/reflected back upward and lost to space. GHG science is junk science cobbled up to support a political agenda that has nothing to do with the climate. No change in our CO2 emissions can or will have any effect on global warming (aka climate change by man). Oh, by the way, the surface has not warmed since 1995-8, 21 to 18 years, and has been cooling since 2006. The upper tropical troposphere have not warmed significantly sing 1988, which is 28 years! First. it punishes the people for using reliable and extensive energy sources. Abiotic gas and oil are indeed renewable from Earth's core and available anywhere that we drill deep enough. And we have 100s of years of coal, by which time we will have developed other even more long-lived energy sources, such as LFTR or cold fusion, both of which are in development right now. Remember, wind and solar energy are the least green energy sources on the planet and are patently unsustainable, particularly as they use rare elements and loads of unrecyclable materials, require huge infrastructure and lots of maintenance, have huge real estate and ecological footprints, and are patently unreliable for any kind of industry or reliable energy grid. Wind and solar are only useful at the end user, where, when it is generating energy, these devices take some of the building's load off the grid. Germany is trying to run its power grid using wind and solar and the power fluctuations, surges, and failures are burning out its power grid. Second, it is increases your cost of living and thus lowers your standard of living. Yes, that's a goal of the globalists. They want to deindustrialize the developed countries and move the remaining people (0.5 to 1 billion, another goal) to a mainly subsistence, agrarian lifestyle. All will be vegans by fiat, with no meat of any kind, as livestock (no meat), guns (no hunting for meat or self defense), and machines (farming by hand as there are not even oxen to pull ploughs) are not allowed in our little human settlements scattered across the country surrounded by No Humans Allowed Ecological Preserves. At least half of the U.S. is slated to be returned to off-limits-to-humans wild lands. Third, it creates a whole new, huge revenue stream for government to spend on whatever they want. You cannot trust them to use it as they say. Once they grow to depend on this new revenue stream, it will be very hard to undo it and it will likely be forced to grow as the politicians will always won't more of your money, as they consider ALL of your money to be theirs (and you are unreasonable for not wanting them to take it). With this new means of bleeding you and your economy, they can slow down and even reverse economic growth, bleeding the economy and using the revenue to implements more ways to force you off your land and take away most of your rights. Carbon tax? No, thank you!